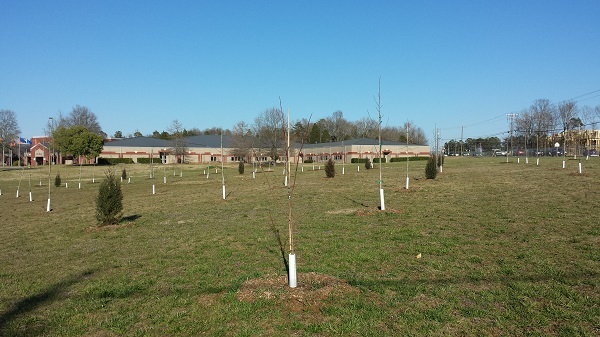 (March 21, 2017) In December, TreesCharlotte and over 150 volunteers planted over 300 trees on the campus of Kennedy Middle School. "TreesCharlotte collaborates with the City of Charlotte to determine the best and most diverse trees species to plant in each location we service. For Kennedy, it looks like we planted cedar, dogwood, maple, oak, and various hardwoods," said Chuck Cole, Executive Director of TreesCharlotte. See Kennedy Middle School Photos and the video below. Trees clean our air, reduce storm water run-off, cool our streets, reduce energy use, enhance wellness, increase property values, and give us beauty. They initially planted a line of trees on the right side of Gallant Lane, directly in front of the ball field. They later relocated about 19 of those trees to make room for the construction of a new sidewalk. Those trees were moved to the reforestation area on the corner of the property. With the help of over 150 volunteers and support of The Charlotte Observer, TreesCharlotte planted over 300 trees at Kennedy Middle School, Saturday, December 3, 2016. The day started out brisk but soon warmed up with all the activity. Thanks to volunteers from Olympic High School & Key Club, Charlotte Dads Group, UNCC students, Carolina's HealthCare System, Environmental Resources Management, Bank of America, and UPS. TreesCharlotte is a pubic/private non-profit that works with the City of Charlotte to help achieve the City Council’s goal of 50% canopy coverage by the year 2050, promotes tree stewardship, and provides education on how to plant and preserve trees. Please visit the Neighborwoods section of the TreesCharlotte web site to learn how your community can qualify for FREE Trees. Trees are planted from October through mid-April; no trees are planted during hot months. Visit TreesCharlotte’s Calendar for the most up-to-date list of events and volunteer opportunities. Planting projects usually start populating online around July, but check the site frequently.